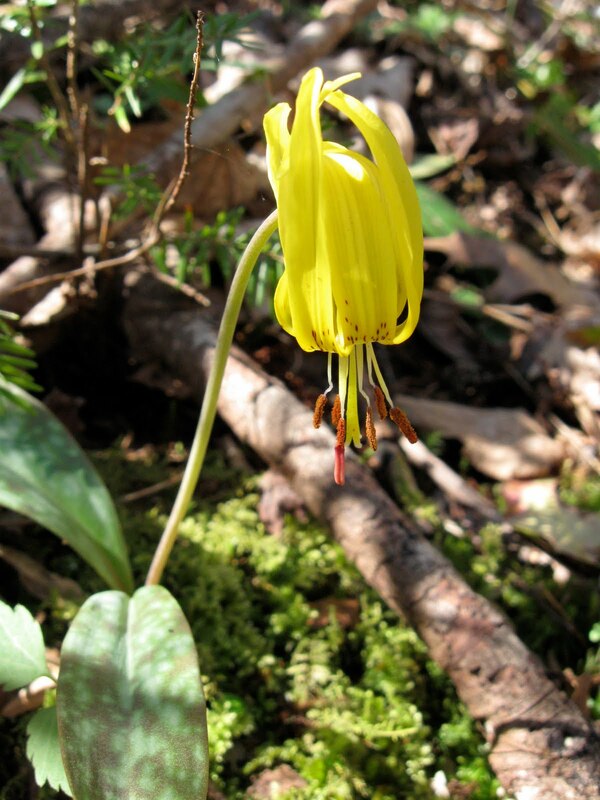 UPDATE 4/27/2010 – For great information about wildflowers in the Great Smoky Mountains National Park, click here. The site includes a helpful video, suggested trails and a link to the annual Spring Wildflower Pilgrimage. Also, two of my more recent posts on summer wildflowers are Smoky Mountains #4: Wildflowers on Balsam Mountain and Blue Ridge Parkway: Summer wildflowers. 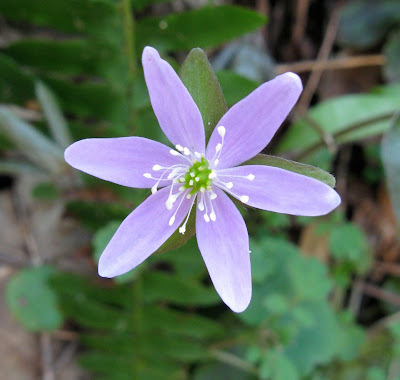 Husband Walter and I are back from a March 30-April 3 visit to the Great Smoky Mountain National Park. We planned a couple photo safaris. Walter targeted water -- the abundant falls, rapids and deep pools characteristic of the Smokies’ running water from drips and trickles to rivers. My focus was spring wildflowers. We were well in advance of the peak wildflower season, but even with the dire warnings about the late appearance of early bloomers, the search was an adventure. Capturing images of these early spring blooms was a treat. 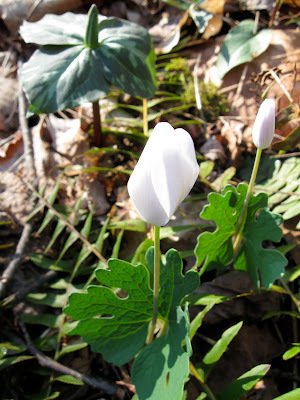 I even spotted some trilliums just opening up. 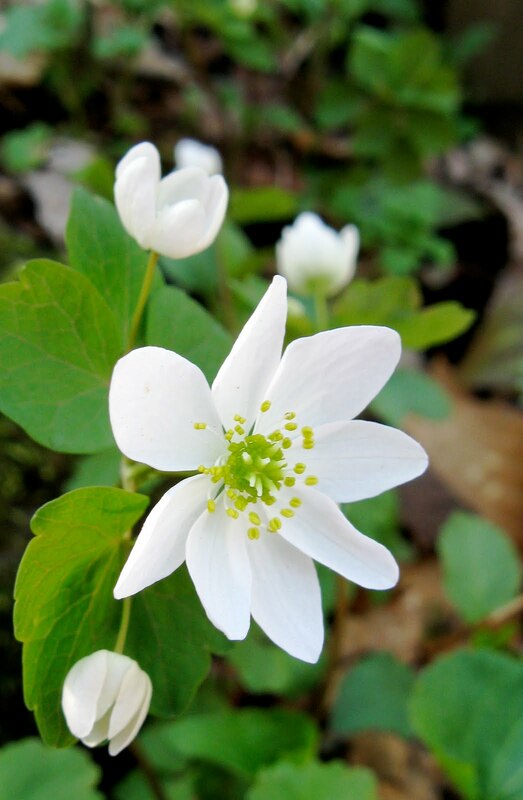 Advice from rangers and volunteers at Sugarlands Visitors Center plus flower-friendly warmer weather were just what I needed for my introduction to some Smoky Mountain flora that I had never seen before. 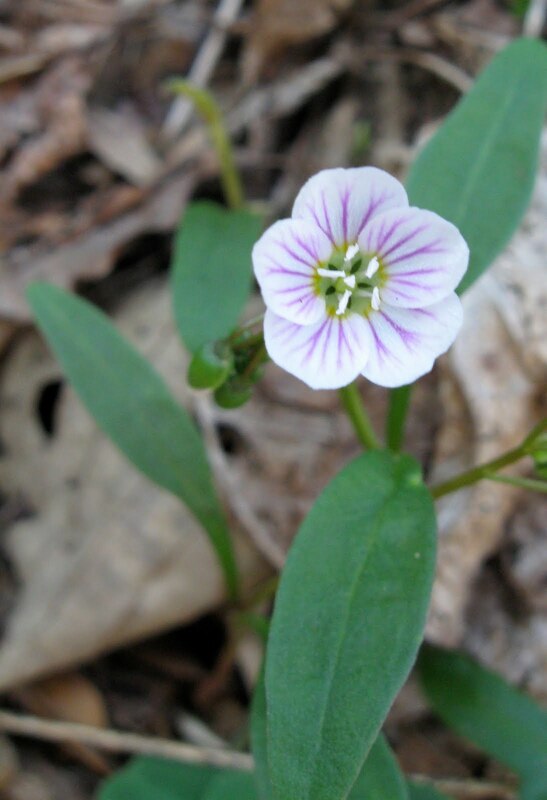 These delicate little flowers were on an embankment by a busy curve on the Newfound Gap Road. I had climbed the embankment. 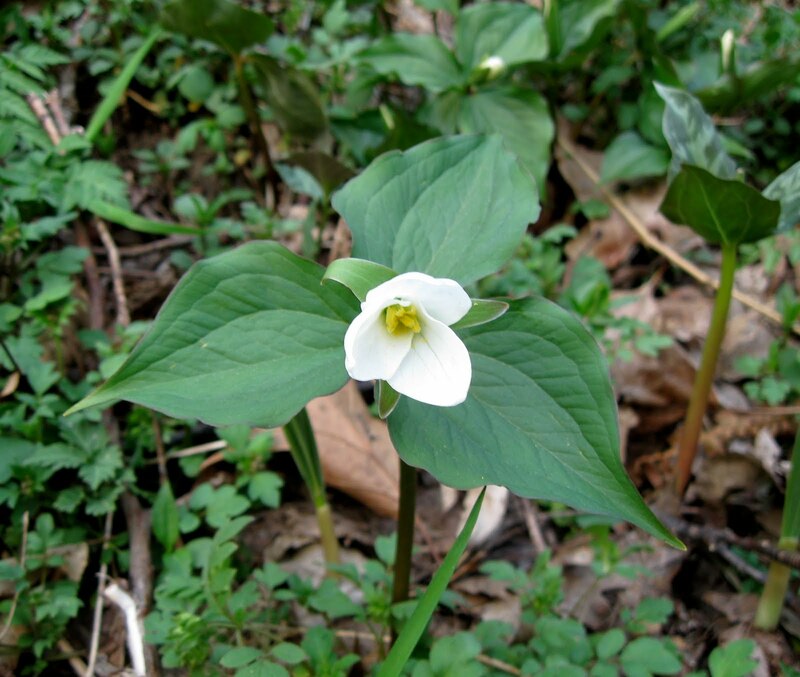 I was trying to avoid disturbing the vegetation in the soft, moist soil and still get within range to photograph the only trilliums I had seen that were even barely opening. I had a precarious hold on a limb with one hand as I operated my little point and shoot with the other. 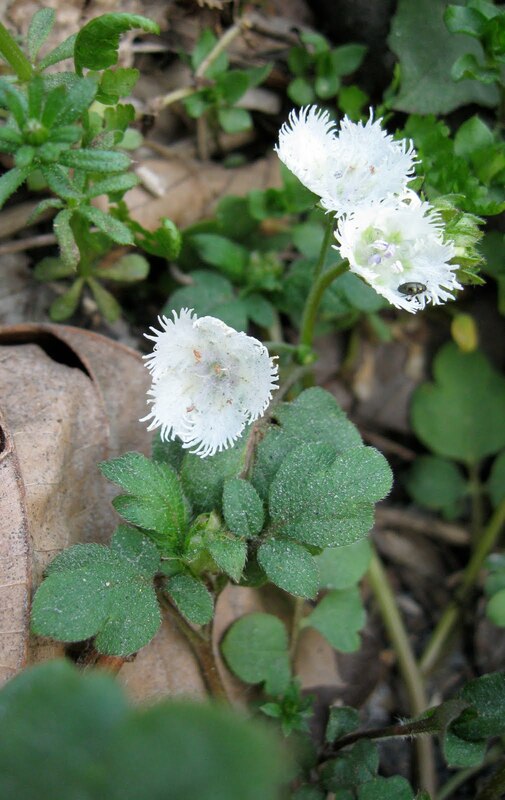 As I eased back down the slope, small patches of the fringed phacelia greeted me. My Wildflowers of the Smokies guidebook says during the first two weeks of April, the tightly packed flowers look as if a light snow has fallen. Other firsts for me were cut-leafed toothwort near the fringed phacelia, rue-anemone and spring beauty on the Cove Hardwood Trail, and bloodroot and trout-lily at the trailhead of Porter’s Creek trail. 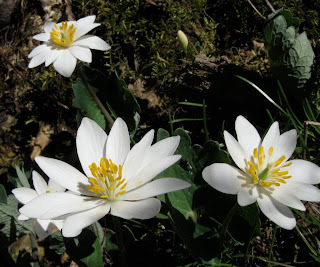 Tightly closed bloodroot blooms begin responding to the sunshine. An hour later the bloodroot blooms are fully open. More experienced flower fanciers were quick to offer help in identifying wildflowers when they saw me aiming my camera at various blossoms. Two field guides were also helpful. 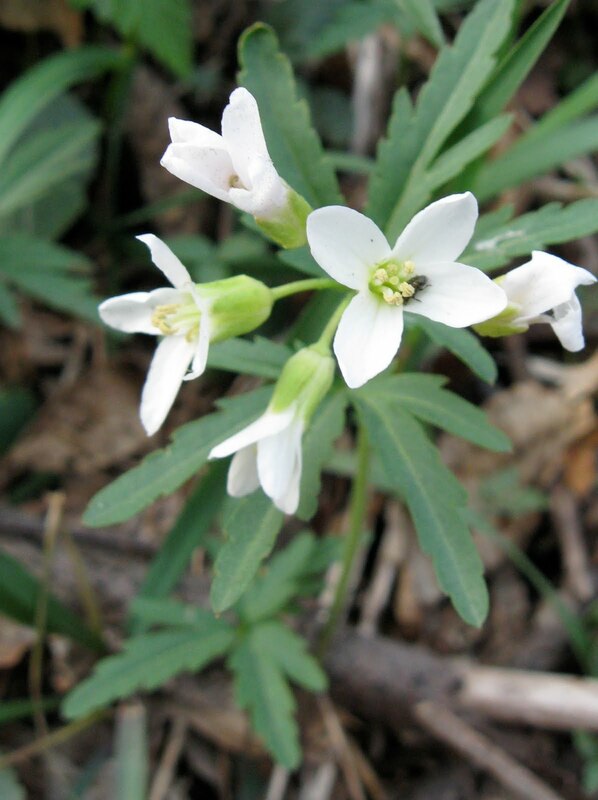 Wildflowers of the Smokies authored by Peter White and a number of co-authors was a small, easy-to-carry paperback. Organized by bloom color, each entry included a helpful photo, description and likely locations for finding the species described. I also like Jack B. Carman's Wildflowers of Tennessee, a heftier paperback. Any misidentification is mine! Lovely blossoms and sunlight framed in wonderful photos! keep on posting some more blogs like this. @Kathy - Thanks for encouraging comments. Yes, it was a totally different experience from the Smokies during summer. With no leaves on trees and little undergrowth, we could see even more streams, and little waterfalls plus the terrain. So different from the green of summer, but totally entrancing. Thank you for sharing these superb photos and also being able to name the species. 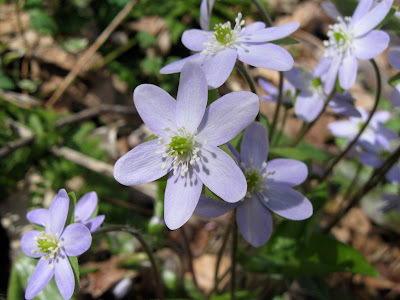 The only one I recognise from the uk is the anemone we call them wood anemones. Well done for all the scrambling I amd sure it is good therapy.